Imagine the difference between our services in France and those to which I have been accustomed in our rather tame and formal civilian congregations. My congregation there was composed almost entirely of men, and those men all very young. We were meeting in a strange land, amid an ancient but alien civilization, which some of us liked and some disliked, but which none of us could quite understand. We had no scroll of the Law, no ram’s horn, not even a complete prayerbook for the festivals. We had no synagogue, and the places we used were lent us by people of another faith, friends and co-workers, indeed, but with little interest in our festivals or our religious needs. Our services were held in the large Y. M. C. A. hut at the chief barracks. The large, bare room was turned over to us for certain hours; the workers closed the canteen and attended the services. And in return I concluded one of the evening services fifteen minutes early so that the regular clientele would not miss their semi-weekly motion pictures. In fact, I found the Y. M. C. A. here, as everywhere, most eager to coöperate with me and to serve the Jews as well as the Christians in the army. My cantor for most of the services was Corporal Cohen of New York, although several other men volunteered for certain portions of the prayers. The head usher was Sergeant Wolf, who looked after the hall and the seating with the thoroughness characteristic of sergeants everywhere. 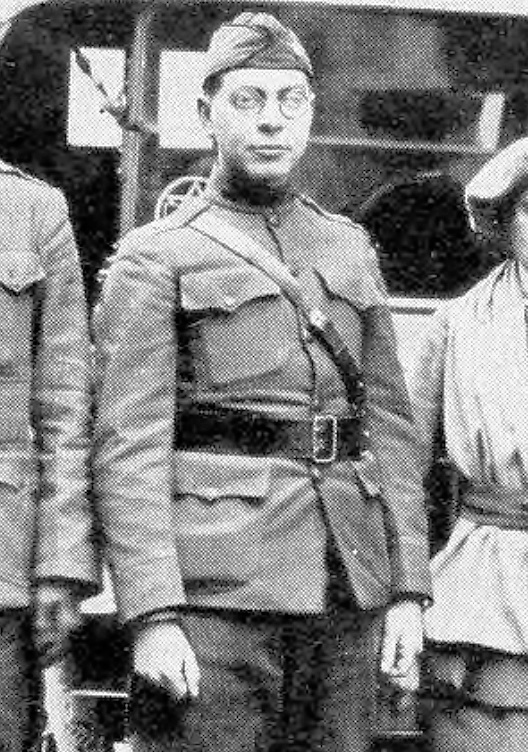 Among the congregation were ten officers, two nurses, and three families of French Jews, as well as a mixed group of enlisted men from every branch in the army, from every section of America and every group of Jewry. The festival had caught us in a foreign land, in the service of America, and it had brought us together as nothing else could have done. We wore our hats during the service because that was the natural desire of the majority, who were of orthodox upbringing. Of course, a soldier naturally wears his overseas cap under any circumstances and it would have needed a special ruling to bring them off. The service was read out of the little prayer book circulated by the Jewish Welfare Board, with which about a fourth of the congregation were already provided from the camps in the States. We read the abbreviated Hebrew service, then about half of the prayers in English, and had an English sermon. The only objection to these innovations came from the cantor, Corporal Cohen, a young man with a traditional Jewish background, who had gathered the other Jews in his company every Friday evening for a brief service and was generally looked up to (although not always followed) as a religious leader. My only way of convincing him was to inquire among some of the other men as to the number who did not understand Hebrew. When he saw that over half of the Jewish soldiers had no understanding of the Hebrew service he withdrew his insistent request for a strict traditionalism and I was saved the necessity of falling back on my military rank. I was much amused after the several services at the number of young men who came to me, complaining about Cohen’s rendering of the services and boasting of their own ability. I was able to give several of them the chance in the ensuing days and found out that it is easy to get a Hebrew reader, quite possible to find one who reads with feeling and understanding, but utterly impossible to pick up in the army a cantor with a trained voice. Our arrangements were made under the approval of my commanding officer, the senior chaplain of the post, and few features of our service were more appreciated than the address of Chaplain Stull at our services on the second day of the festival. I had hesitated to invite him, and was therefore doubly surprised when he assured me that this was the third successive year that he had preached at a Jewish New Year service: two years before on the Mexican Border, the year before in training camp in the States and now in the American Forces in France, Chaplain Stull was a regular army chaplain of eighteen years standing, and his membership in the Methodist Episcopal church was less conspicuous in his makeup than his long experience in army life. His sermon was one of the outstanding events of our holy season. His explanation of the vital importance of the Service of Supply to the army at the front came with personal weight for he had just come back from the fighting forces to take a promotion in the rear. His moral interpretation of the significance of each man to the whole army was the sort of thing that the soldier needs and likes. These services were unusual in that they were the first holy season which most of the men had spent away from home. The war was still on then; the St. Mihiel drive took place the day after Rosh Hashana; the news from the front was usually good and always thrilling… But the shadow of war was dark upon us all. We were in the uncertainty, the danger, the horror of it. We felt a personal thrill at the words of the prayers,—”Who are to live and who to die; who by the sword and who by fire.” We recited with personal fervor the memorial prayer for our fallen comrades. Many among us were eager to give thanks at recovery from wounds. Therefore, the desire for a religious observance of our solemn days was all the greater. Men came in from a hundred miles, often walking ten miles to a train before they could ride the rest. A Jewish Chaplain in France can be downloaded for free from Project Gutenberg in several formats, and is available as a paperback from Amazon. I haven’t seen the paperback edition and can’t vouch for it. This entry was posted in High holidays, Jewish holidays, Soldiers. Bookmark the permalink.